With the EU’s new renewable energy policy the EU has introduced the most comprehensive and advanced binding sustainability scheme of its kind anywhere in the world. It will apply equally to domestically produced and imported biofuels and bioliquids. These sustainability criteria are set out in the Renewable Energy Directive, adopted in 2009 (1). For biofuels, corresponding criteria are set out in the Fuel Quality Directive (2). This Communication sets out how Member States and economic operators can implement the sustainability criteria and the Renewable Energy Directive's counting rules for biofuels in practice. This Communication has no binding character. It is designed to assist Member States and to facilitate a consistent implementation of the sustainability criteria. It is accompanied by a Communication on voluntary schemes and default values and by Commission guidelines for the calculation of land carbon stocks. The sustainability criteria apply to biofuels/bioliquids produced in the EU and to imported biofuels/bioliquids. are taken into account under the provisions for alternative-fuel vehicles of the Regulation on CO2 from passenger cars (‘E85’ bioethanol only) (8). This Communication is accompanied by Commission guidelines for the calculation of land carbon stocks (9) — a binding document adopted according to Annex V, point 10 of the Renewable Energy Directive; and by a Communication on voluntary schemes and default values (10). This Communication uses the article numbers of the Renewable Energy Directive to refer to specific provisions. The table indicates where corresponding provisions for biofuels are found in the Fuel Quality Directive. References in this Communication to ‘the Directive’ refer to the Renewable Energy Directive. Where the Fuel Quality Directive contains a corresponding provision, they apply equally to that Directive. The Directive contains sustainability criteria related to greenhouse gas savings (13), land with high biodiversity value (14), land with high carbon stock (15) and agro-environmental practices (16). These sustainability criteria have to be met for the purposes listed in Section 1. This means that the criteria do not apply to all biofuels/bioliquids, only those covered by these purposes — although currently this includes the vast majority. in accordance with the terms of a bilateral or multilateral agreement concluded by the Union and which the Commission has recognised for the purpose (20). Different methods can be used to show compliance with different criteria. Member States need to define which economic operators need to submit the information concerned. Most transport fuels are subject to excise duty, which is payable on release for consumption (21). The obvious choice is to place the responsibility for submitting information on biofuels on the economic operator who pays the duty. At this point information with regard to the sustainability criteria along the entire fuel chain should be available (22). For bioliquids and for certain biofuels, e.g. those used in captive fleets or aviation, separate provisions to identify the responsible economic operator may be needed. Member States have to require that economic operators arrange for an adequate standard of independent auditing of the information submitted (23). Where economic operators use a voluntary scheme or bilateral/multilateral agreement recognised by the Commission to show compliance with the sustainability criteria, this is already arranged for by the recognition. Where economic operators follow a procedure laid down in national legislation, Member States are invited to draw on the requirements in relation to the adequate standard of independent auditing and the mass balance system (24) in Section 2.2 of the Communication on voluntary schemes and default values (25). The criterion related to agricultural and environmental requirements and standards for EU farmers applies only to biofuels/bioliquids produced from raw materials originating in the EU. Unlike the other criteria, verification of compliance for this criterion is not addressed in the Directive (27). Member States can be expected to rely on their existing control systems (28) for ensuring that farmers fulfil these requirements. If there are farmers on their territory who supply raw materials for biofuels/bioliquids but are not covered by these control systems, Member States will need to include them. If a control system reveals breach of this criterion, the Member State will need to ensure that this is taken into account for the purposes listed in Section 1. As laid down in the Directive, ‘biofuels’ means liquid or gaseous fuel for transport produced from biomass. ‘Bioliquids’ means liquid fuel produced from biomass for energy purposes other than transport (29). The latter includes only liquid fuels. This means that the sustainability criteria apply to biogas for transport and not to biogas used for heating or electricity. Although many types of biofuel are mentioned in the Directive (30), these listings are to facilitate the implementation of the Directive and are not exhaustive. Biofuels and bioliquids that are not listed can also count towards the Directive's targets. It is considered that the term ‘bioliquids’ includes viscous liquids such as waste cooking oil, animal fats, palm oil, crude tall oil and tall oil pitch. For biofuels/bioliquids produced from waste, and from residues other than agricultural, aquaculture, fisheries and forestry residues, only the sustainability criterion relating to greenhouse gas savings applies (31). What constitutes a waste or residue is addressed in Section 5. Agricultural, aquaculture, fisheries and forestry residues are residues that are directly produced by agriculture, fisheries, aquaculture and forestry; they do not include residues from related industries or processing. The Directive's sustainability criteria are fully harmonised at Community level and were adopted under Article 95 (internal market) of the EC Treaty. Therefore, Member States may not set additional criteria of their own for the purposes 1 to 4 listed in Section 1 (32). This means that Member States may not for those purposes exclude biofuels/bioliquids on other sustainability grounds than the sustainability criteria laid down in the Directive (33). However, where certain biofuels/bioliquids are both more beneficial than others and more expensive to produce, national support schemes may take their higher production costs into account (34). Member States will receive information from economic operators on compliance with the sustainability criteria. They will also receive information on the country of origin of all road transport fuels, fossil and renewable, and where they are purchased (35). Under the Renewable Energy Directive, there is no requirement on Member States to make information public, nor are they prohibited from doing so. The Commission encourages Member States that publish such information to do this in a consistent manner for all fuels. In the Commission's view, if a Member State decides to publish such information it should take into account the possible commercially sensitive character of a company's specific information in that respect. The Commission will publish the aggregated information received from Member States for biofuels and bioliquids on its transparency platform in summary form (36). The Directive requires a greenhouse gas emission saving of 35 % (rising to 50 % in January 2017, and 60 % in January 2018 for installations in which production started from 2017 onwards) (37). It contains a methodology for calculating this saving (‘actual value’) as well as ‘default values’, including ‘disaggregated default values’, that can be used in certain cases to show compliance with the criterion. Biofuels/bioliquids produced by installations that were in operation on 23 January 2008 are exempted from complying with the greenhouse gas saving criterion until 1 April 2013 (38), so that e.g. wheat ethanol plants with lignite as process fuel and palm oil mills without methane capture are given time to adapt their process. The term ‘installation’ includes any processing installation used in the production process. It should not be understood as including production facilities that might have been intentionally added to the production chain only to qualify for the exemption foreseen in this provision. If at least one of such processing installations used in the production chain was in operation on 23 January 2008 at the latest the criterion of a minimum 35 % greenhouse gas saving starts to apply only from 1 April 2013. The Directive contains ‘default values’ that economic operators can use to provide evidence of compliance with the greenhouse gas saving criterion (39). Annex I to this Communication gives guidance on when default values can be used, including when combinations of disaggregated default values and actual values can be used (40). The default values can be updated by the Commission. The process of updating the default values is addressed in the Communication on voluntary schemes and default values. The Directive also contains ‘typical values’ for greenhouse gas emissions from biofuels (41). These values cannot be used by economic operators. They can be used by Member States in their biennial reporting to the Commission on progress in the promotion and use of energy from renewable sources (42). Actual values for greenhouse gas savings can always be used regardless of whether there exists a default value for the biofuel/bioliquid in question. 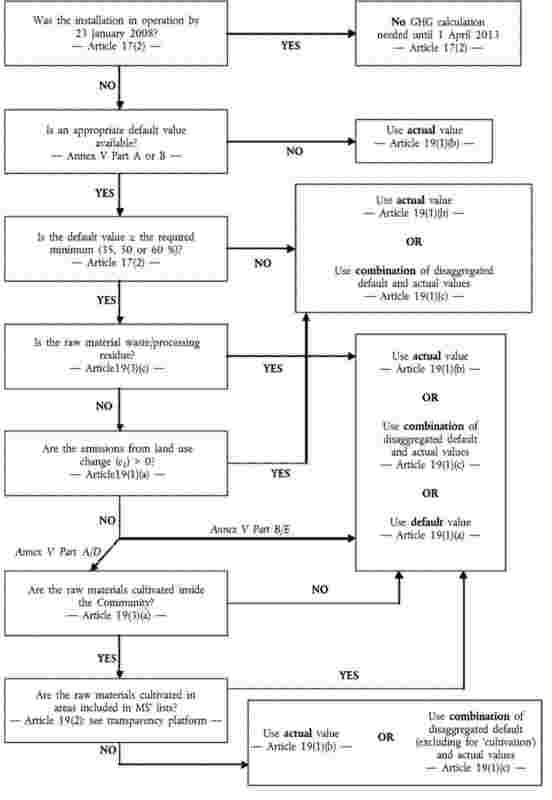 Annex V part C of the Directive contains the rules for the calculation of an actual value. It would not seem necessary to include in the calculation inputs which will have little or no effect on the result, such as chemicals used in low amounts in processing (43). For the calculation of emissions from ‘cultivation’, the method allows for the use of averages (for a particular geographical area) as an alternative to actual values (44). This could be particularly useful for feedstocks where no default value exists and for EU regions where the use of default values is not permitted for some feedstocks (45). Member States can draw up lists of such average values; they could also be incorporated in voluntary schemes that address greenhouse gas emission impact (46). The Commission intends to publish on its transparency platform annotated examples of calculations of actual values as well as a set of standard values, derived from the datasets used to establish the default values, that could be used for some of the coefficients used in the calculation of actual values. Further elements on the methodology for calculating the greenhouse gas impact are contained in Annex II to this Communication. The Directive identifies categories of land with high biodiversity value (47). Raw material for biofuels/bioliquids should not be taken from this land. The Directive identifies categories of land with high carbon stocks (48). If land fell into one of these categories in January 2008 and no longer does, raw material for biofuels/bioliquids should not be taken from the land. For some of these criteria the Directive allows for exceptions, provided that certain evidence is provided. If land belongs to more than one of these land categories, all the relevant criteria apply. Eligibility for an exception under one of the criteria would not confer an exception from other criteria that apply. Raw material should not be obtained from primary forest and other (primary) wooded land; designated nature protection areas; and highly biodiverse grassland (49). The Commission intends to establish in 2010 the criteria and geographic ranges to determine which grassland can be considered to be highly biodiverse grassland (50). In the case of non-natural highly biodiverse grassland, an exception is possible where evidence is provided that the harvesting of the raw material is necessary to preserve the area's grassland status. In the case of nature protection areas, an exception is possible where evidence is provided that the production of raw material did not interfere with the nature protection purpose in question (51). The Commission is aware that CEN, the European Committee for Standardisation, is working on the issue of what kind of evidence should be provided. The Directive includes a procedure under which new nature protection areas can be taken into account following a Commission decision (52). At present there are no such areas recognised. When decisions are made to recognise areas, information on these decisions will be made available on the Commission's transparency platform. Raw material should not be obtained from wetland; continuously forested areas; areas with 10-30 % canopy cover; and peatland — if the status of the land has changed compared to its status in January 2008 (53). Thus if raw material is taken from land that was wetland (54) in January 2008 and is still wetland when the raw material is taken, using such material would not breach the criterion. The term ‘status’ refers to the physical categories defined in the Directive. Land use change that is not captured by this criterion still has to be taken into account in the calculation of the greenhouse gas impact (see Annex II). Before considering the concept of ‘continuously forested area’, it should be recalled that any change in land use must be taken into account in the calculation of the greenhouse gas impact (56), as well as potentially needing to be taken into account under policy headings other than this Directive. The term ‘continuously forested area’ is defined in the Directive as land spanning more than one hectare with trees higher than five metres and a canopy cover of more than 30 %, or trees able to reach those thresholds in situ. It does not include land that is predominantly under agricultural or urban land use (57). For land that is similar to continuously forested areas but has canopy cover between 10 % and 30 %, an exception is possible where evidence is provided that the greenhouse gas impact (59), including any changes since January 2008 in the carbon stock of the area concerned, meets the appropriate threshold for the greenhouse gas saving criterion. there has not been draining of the soil since January 2008. This means that for peatland that was partially drained in January 2008 a subsequent deeper drainage, affecting soil that was not already fully drained, would constitute a breach of the criterion. Peat itself is not considered biomass (61). Evidence of compliance with the land-related criteria could take many forms, including aerial photographs, satellite images, maps, land register entries/databases (62) and site surveys. Evidence can be ‘positive’ or ‘negative’. a map of all the primary forests in the region, showing the land to fall outside them (negative). The criteria refer to the status of the land in January 2008. But the use of earlier evidence is not ruled out. For example, if it is shown that land was cropland a little earlier than 2008, e.g. in 2005, this may be enough to show compliance with some or all of the land-related criteria. The Commission intends to publish on its transparency platform guidance for economic operators for identifying the land categories concerned. Certain fuels consist only partly of renewable material. For some of these, such as ETBE, Annex III to the Directive indicates what percentage of the fuel is renewable for the purpose of target accounting (63). For such fuels not listed in Annex III, including fuels produced in flexible processes that do not always deliver consignments with the same mix of sources, analogy can appropriately be drawn from the rule for electricity generated in multi-fuel plants: ‘the contribution of each energy source is to be taken into account on the basis of its energy content’ (64). For the purposes of compliance with the sustainability criterion on greenhouse gas savings, the biomass-derived part of fuels referred to in the previous paragraph has to meet the appropriate threshold. For some, such as ETBE, the Directive gives default values. The percentages in Annex III to the Directive also apply when determining whether fuels containing biofuels need to have specific indication at sales points (65). For example, petrol containing 20 % ETBE would not require specific indication because less than 10 % is from renewable sources. Certain biofuels count double for demonstrating compliance with the 10 % target for the share of energy in all forms of transport in 2020 and for compliance with national renewable energy obligations (66). All other biofuels must be counted singly. Where biofuels are produced only in part from materials that count double, the double counting only applies to that part of the biofuel (67). The biofuels that count double include those from wastes and residues. for the greenhouse gas methodology: no emissions are allocated to co-products which production did not aim for, such as straw in the case of wheat production (69). In this context waste can be understood as any substance or object which the holder discards or intends or is required to discard (70). Raw materials that have been intentionally modified to count as waste (e.g. by adding waste material to a material that was not waste) should not be considered as qualifying. A processing residue is a substance that is not the end product(s) that a production process directly seeks to produce. It is not a primary aim of the production process and the process has not been deliberately modified to produce it. Examples of residues include crude glycerine, tall oil pitch and manure. (1) Article 17 of Directive 2009/28/EC. (2) Article 7b of Directive 98/70/EC as amended by Directive 2009/30/EC. (3) Article 17(1)(a). Following from the scope of ‘final energy consumption’ as in Regulation (EC) No 1099/2008 this includes biofuels used in international aviation (when sold in a Member State), but not in international maritime transport. (4) Article 17(1)(b). As defined in Article 2(l) of the Renewable Energy Directive. (5) Article 17(1)(c). Typically as part of a national support scheme. (6) Article 7a of the Fuel Quality Directive. (7) OJ C 82, 1.4.2008, p. 1. (8) Article 6 of Regulation (EC) No 443/2009. (9) OJ L 151, 17.6.2010, p. 19. (10) See page 1 of this Official Journal. (12) Where documents are relevant for the Fuel Quality Directive, the Commission intends to publish them also on the Fuel Quality Directive's website. (15) Article 17(4) and (5). (19) Article 18(4) second subparagraph; Article 18(7). (20) Article 18(4) first subparagraph; Article 18(7). (21) Cf. Directive 2008/118/EC and Directive 2003/96/EC. (22) The one exception could be the greenhouse gas emissions from distribution of the fuel (if needed for the calculation of an actual value). It would be appropriate to use a standard coefficient for this. (25) An important difference is that under a voluntary scheme, as a general rule a voluntary scheme should ensure that economic operators are audited before allowing them to participate in the scheme. There is no need for such a requirement in national systems, under which it may well be appropriate to provide for ad hoc claims by economic operators. (28) Under Article 22 of Regulation (EC) No 73/2009. (30) E.g. in Annexes III and V.
(32) For the purposes of 5 and 6 listed in Section 1 this question is not relevant. (34) Cf. recitals 89 and 95 of the Renewable Energy Directive as well as the Community guidelines on State aid for environmental protection. (35) Article 7a(1)(a) of the Fuel Quality Directive. (38) Article 17(2), last subparagraph. (40) It should be noted that the allocation of emissions to co-products has been taken into account in the calculation of the (disaggregated) default values. (43) It is relevant to note here that figures for greenhouse gas savings are rounded to the nearest percentage point. (44) Cf. Annex V part C point 6. (45) Cf. Article 19(2) and (3). (48) Article 17(4) and (5). (51) Article 17(3)(b); applies to both (i) and (ii) thereof. (53) Article 17(4) and 17(5). (56) Cf. Annex II to this Communication. (57) Land under agricultural use in this context refers to tree stands in agricultural production systems, such as fruit tree plantations, oil palm plantations and agroforestry systems when crops are grown under tree cover. (59) Annex V part C.
(62) E.g. the Integrated Administration and Control System (IACS) for the EU's Common Agricultural Policy. (67) That part being the physical share (the ‘mass balance system’ for the sustainability criteria does not apply to this provision). (68) Cf. recital 89 of the Renewable Energy Directive. (69) Cf. Annex V, part C, point 18. (70) Including materials that have to be withdrawn from the market for health or safety reasons. use of soil improver (e.g. compost). Emission savings from such improvements can be taken into account if evidence is provided that the soil has carbon increased, or solid and verifiable evidence is provided that it can reasonably be expected to have increased, over the period in which the raw materials concerned were cultivated (1). The emission savings in terms of g CO2-eq/MJ can be calculated by using a formula as indicated in point 7 of the method, replacing the divisor ‘20’ by the period (in years) of cultivation of the crops concerned. The inputs/variables that affect emissions from cultivation will typically include seeds, fuel, fertiliser, pesticide, yield, and N2O emissions from the field. The short carbon cycle uptake of carbon dioxide in the plants is not taken into account here; to balance this, the emissions from the fuel in use are not taken into account in point 13. The methodology for ‘cultivation’ allows — as an alternative to actual values — for the use of averages for smaller geographical areas than those used in the calculation of the default values. The default values were (with one exception) calculated for a global level. However, within the EU, the Directive places restrictions on their use. These restrictions operate at the level of NUTS 2 areas (2). It seems to follow that within the EU, the averages should be for NUTS 2 areas or for a more fine-grained level. A similar level would logically also be appropriate outside the EU. An appropriate way to take into account N2O emissions from soils is the IPCC methodology, including what are described there as both ‘direct’ and ‘indirect’ N2O emissions (3). All three IPCC tiers could be used by economic operators. Tier 3, which relies on detailed measurement and/or modelling, seems more relevant for the calculation of ‘regional’ cultivation values (cf. Section 3.3 of this Communication) than for other calculations of actual values. Land-use change should be understood as referring to changes in terms of land cover between the six land categories used by the IPCC (forest land, grassland, cropland, wetlands, settlements and other land) plus a seventh category of perennial crops, i.e. multi-annual crops whose stem is usually not annually harvested such as short rotation coppice and oil palm (4). This means, for example, that a change from grassland to cropland is a land-use change, while a change from one crop (such as maize) to another (such as rapeseed) is not. Cropland includes fallow land (i.e. land set at rest for one or several years before being cultivated again). A change of management activities, tillage practice or manure input practice is not considered land-use change. The guidelines for the calculation of land carbon stocks (5) provide detail on the calculation. The Commission intends to publish on its transparency platform an annotated example for the calculation of emissions from carbon stock changes due to land use change. The Directive requires the use of the average emission intensity for a ‘defined region’. In the case of the EU the most logical choice is the whole EU. In the case of third countries, where grids are often less linked-up across borders, the national average could be the appropriate choice. The lower heating value used in applying this rule should be that of the entire (co-)product, not of only the dry fraction of it. In many cases, however, notably in relation to nearly-dry products, the latter could give a result that is an adequate approximation. Since heat does not have a lower heating value no emissions can be allocated to it on that basis. No emissions should be allocated to agricultural crop residues and processing residues, since they are considered to have zero emissions until the point of their collection (6), nor to waste. Further detail on waste and residues is in Section 5.2. Allocation should be applied directly after a co-product (a substance that would normally be storable or tradable) and biofuel/bioliquid/intermediate product are produced at a process step. This can be a process step within a plant after which further ‘downstream’ processing takes place, for either product. However, if downstream processing of the (co-) products concerned is interlinked (by material or energy feedback loops) with any upstream part of the processing, the system is considered a ‘refinery’ (7) and allocation is applied at the points where each product has no further downstream processing that is interlinked by material or energy feedback-loops with any upstream part of the processing. Where the CHP supplies heat not only to the biofuel/bioliquid process but also for other purposes, the size of the CHP should be notionally reduced — for the calculation — to the size that is necessary to supply only the heat necessary for the biofuel/bioliquid process. The primary electricity output of the CHP should be notionally reduced in proportion. To the amount of electricity that remains — after this notional adjustment and after covering any actual internal electricity needs — a greenhouse gas credit should be assigned that should be subtracted from the processing emissions. The amount of this benefit is equal to the life cycle emissions attributable to the production of an equal amount of electricity from the same type of fuel in a power plant. The fossil fuel comparator to be used at present for biofuels is 83,8 g CO2-eq/MJ. This value will be superseded by ‘the latest actual average emissions from the fossil part of petrol and diesel in the Community’ when that information becomes available from the reports submitted under the Fuel Quality Directive (8). That reporting has to be done yearly, starting with reporting for 2011. If it is possible to calculate it, the Commission will publish the new value for the fossil fuel comparator on its transparency platform accompanied by a date from which the figure can be considered ‘available’ and has to be used. The Commission will take into account the latest such update in its next amendment of the typical and default values in the Directive. (1) Measurements of soil carbon can constitute such evidence, e.g. by a first measurement in advance of the cultivation and subsequent ones at regular intervals several years apart. In such case, before the second measurement is available, increase in soil carbon would be estimated using a relevant scientific basis. From the second measurement onwards, the measurements would constitute the basis for determining the existence of an increase in soil carbon and its magnitude. (3) Cf. 2006 IPCC guidelines for National Greenhouse Gas Inventories, Volume 4, Chapter 11 (http://www.ipcc-nggip.iges.or.jp/public/2006gl/pdf/4_Volume4/V4_11_Ch11_N2O&CO2.pdf). (4) Because such land has features of both cropland and forest land. (5) OJ L 151, 17.6.2010, p. 19. (6) Similarly, when these materials are used as feedstock they start with zero emissions at the point of collection. (7) cf. Annex V, part C, point, 18 last subparagraph. (8) Under Article 7a of the Fuel Quality Directive (road) fuel/energy suppliers designated by Member States have to report to designated authorities on: (i) the total volume of each type of fuel/energy supplied, indicating where purchased and its origin; and (ii) the life cycle greenhouse gas emissions per unit of energy.